After Strictly Inc, it has become a bit quiet regarding Tony Banks' solo work. He did indeed release two albums with classical music (Seven and SIX), but Tony's rock/pop music solo career seems over. 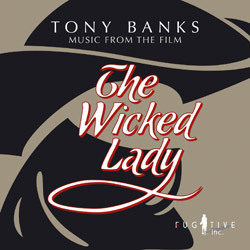 Now, one of his soundtracks, that was never released on CD, will come out on CD in April: The Wicked Lady. It can already be preordered at amazon-uk here. Following that release, there are also plans to release his other soloalbums (A Curious Feeling, The Fugitive, Soundtracks, Bankstatement, Still and Strictly Inc). No specific release dates are known as yet, also non information about possible bonus tracks or remaster work is available right now. The subject was also discussed in an interview we did with Tony a year ago (follow this link). Also, Tony has started his brand new Facebook Page a while ago.